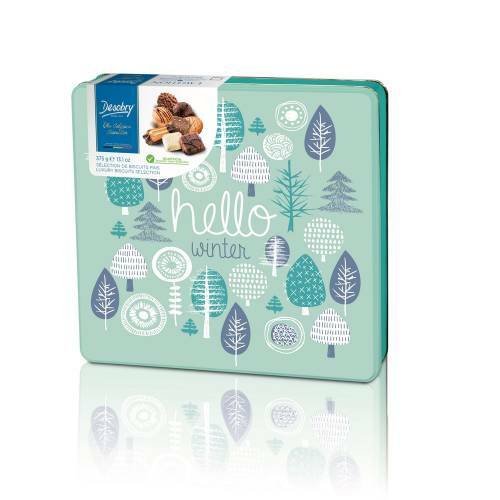 A magnificent metal box with an autumn design with inside, an assortment of biscuits with Belgian chocolate. Wheat flour, sugar, milk chocolate 15,5 % (sugar, cocoa butter, whole milk powder, cocoa mass, lactose (milk), emulsifier : soya lecithin), vegetable fats (palm, copra, palm kernel), dark chocolate 10,2 % (sugar, cocoa mass, cocoa butter, anhydrous milk fat, emulsifier : soya lecithin, natural vanilla flavour), white chocolate 5,4 % (sugar, cocoa butter, whole milk powder, emulsifier : soya lecithin, natural vanilla flavour), white filling (vegetable fats (palm, sunflower, rapeseed), sugar, skimmed milk powder, lactose (milk), emulsifier : soya lecithin), milk filling (vegetable fats (palm, sunflower, rapeseed), sugar, skimmed milk powder, lactose (milk), fat reduced cocoa powder, emulsifier : soya lecithin), rapeseed oil, crunchy cereals (rice flour, wheat gluten, wheat malt, salt, sugar, dextrose), Guérande salted caramel (glucose syrup, sugar, vegetable fats (palm, palm kernel), butter (milk), water, liquid cream (fat : 31 %) (milk), Guérande salt (1,25 %), emulsifier : soya lecithin), whole eggs, coconut, inverted sugar syrup, hazelnut filling (sugar, hazelnut paste, vegetable fats (palm kernel, palm), skimmed milk powder, fat reduced cocoa powder, emulsifier : soya lecithin, natural vanilla flavour), soya bean flour, hazelnut paste (sugar, hazelnuts, hazelnut oil), dextrose, egg whites, caramelized almonds, almonds, whey (milk), whole milk powder, roasted cocoa bean glares, caramelized hazelnuts, dark chocolate of Ghana (cocoa mass Ghana, sugar, cocoa butter, emulsifier : soya lecithin, natural vanilla flavour), salt, skimmed milk powder, fat reduced cocoa powder, raising agents (sodium carbonates, ammonium carbonates, diphosphates), natural flavours, hazelnuts, wheat starch, natural vanilla extract, emulsifier (soya lecithin), cinnamon. Dark chocolate : cocoa solids 46 % minimum. Milk chocolate : cocoa solids 31 % minimum. Dark chocolate of Ghana : cocoa solids 70 % minimum. Low-fat cocoa powder : cocoa butter 10 %. Store in a cool, dry place.